Sorry for the lack of reports but our neighborhood was basically without power for the past 3 days. Allegedly some guy was burning brush and it started a couple power poles on fire and it took 3 days to fix. So for 3 days no fans, no ac, no hot showers, no morning coffee…it’s been worse than camping. The fishing the past few days has been average…not great but not bad either. Most of the groups were catching anywhere from 3 to 6 sailfish as well as some mahi mahi and a few marlin. All of the guys I talked to said that they saw dozens and dozens of sailfish the past few days…they were just not feeding. Several captains told me they counted more than 100 free jumpers and swimmers. One guy I talked to this evening said he heard the bite started to pop today and a couple boats had 20 plus bites about 30 miles offshore. My buddies are going out in our boat tomorrow so I should know if the bite turns on. I’ll be stuck at home working like a rented mule trying to get caught up on emails and other things after our 3 day power outage. Yesterday was not a very good day offshore. My friends and I went went out hoping to catch just one marlin. We knew the sailfish bite was slow but we also knew there were some marlin around. We caught a couple sails and we did about average compared with other boats. There were some marlin caught…the 60 Bertram caught a 350 pound blue and a sailfish. And there were several private boats that caught blues. Today it looked a little like rainy season out there…cloudy, grey with some rumbling in the distance. Not much rain…yet. The main talk around the marina the past couple of days has been the marlin bite. The 42′ Maverick caught a few sails, a tuna and raised 3 marlin yesterday. The 36 Topaz also raised 3 marlin the other day and I think they got all 3 to the boat. The sailfish bite has averaged out with most boats getting 3 to 5 sails per day…there have also been a few mahi and a few tuna around. The inshore bite has been really slow…a couple boats did inshore trips recently and one group caught 4 small roosters one day and then got skunked on day 2. Another group did a full day inshore and had no bites…so they are going offshore from now on. The bite today was not as red hot as yesterday but it was still solid. The 36′ Topaz raised 15 sails and released about half that many. The 42 Maverick caught 9 sails and 4 mahi. My buddies went out in our 26′ and went 3 for 6 on sailfish on a 3/4 day trip. I heard rumors all week of a VIP boat coming into this area. Today everyone is talking about the big yacht allegedly owned by Bill Gates…it was here for 24 hours and has moved on. 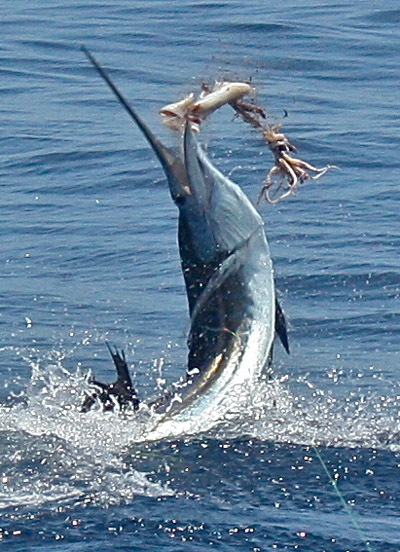 The sailfish bite blew up today offshore about 35 miles in front of Los Suenos and Jaco Beach. The 42′ Maverick released 15 sailfish today with a family group. The 36′ Topaz released 29 sailfish today with a couple from south Texas. The captain said they must have raised 45 sailfish, he also said they went through 75 ballyhoo. These people are fishing 3 more days…they may be worn out. The 32′ Irwin Forbes had a single angler hooking his own fish and they released 13 sailfish today. Looks like we got our boat legal just in time. My buddies are going out on our boat tomorrow and I will probably try and get out there Monday or Tuesday if the bite holds. I have tomorrow reserved for a little work, a little bbq, some colds beers and the final round of the Masters. The pics above are from some friends that recently fished….the sailfish expelling some big squid from its belly is a great pic. They were not using squid for bait. I talked to the captain of the 42′ Maverick this morning and they have been raising more than 20 sails a day and they caught 1 marlin yesterday and 3 marlin a couple days ago. They have also got in on some of the tuna that have been around lately. I have several groups fishing with these guys over the next few days so hopefully the bite holds steady. Both the 36′ Topaz and 38′ Custom caught a marlin yesterday. The charter docks are always a little slow after Easter week with just a handful of boat going out each day. The fishing the last few days around Los Suenos has been a good mix of fish. They are seeing fewer sailfish than they did last week but some tuna and marlin have moved in. Almost everyone I talked had seen a marlin or was right next to someone that did. One of the 42′ Mavericks released 1 sailfish and caught 3 tuna the other day…one of the tuna’s was 150 pounds and took 3 hours to get to the boat. Had they not spent 3 hours on one fish they probably would have caught several more fish. One of the 36′ on the charter dock released 3 sails, kept 3 tunas and saw 2 marlin. The 60′ Bertram released 1 sailfish and kept a handful of yellowfin tunas. My boat is finally legal again. My navigation permit expired and it took more than a month to get the inspector to come out and inspect my boat. The joys of Costa Rica. I want to warn people again of who you book your fishing trips through. I took a call the other day and it was a guy looking to book a boat for someone. I ask for details and I gave him a couple good options between $750 and $1200 per day. He told me he wanted the $750 boat but was going to charge them $1200 so he could make some $450 in extra commission. I told him I wasn’t going to be involved in that and told him if the guy wants to spend $1200 then put him on a $1200 boat. He did not call me back so he must have found someone else to do his dirty deal. If you are booking a trip from someone they should at least have some sort of website with the services they offer and they should have boat prices listed on their website. If they don’t have boat prices listed then I’m not sure I would trust them. “Everyone and their brother tries to book charter boats in Costa Rica. I am always amazed when people book a trip with someone who knows nothing about fishing and sometimes nothing about Costa Rica. 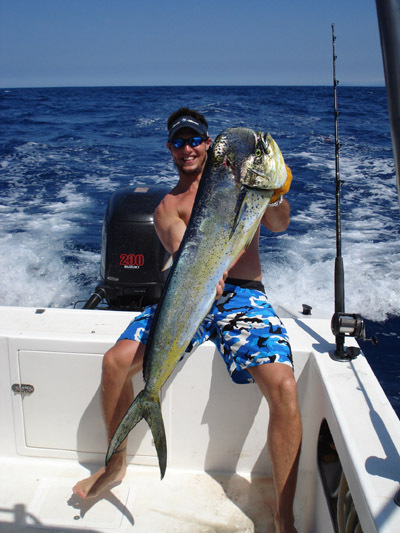 The fishing the last few days out of the Los Suenos Marina has been steady. Everyone I talked to has been raising anywhere from 3 to 12 sails per day and maybe a mahi or tuna if they were in the right place at the right time. I also heard there was a decent amount of marlin being raised. The 36 Topaz released 7 sailfish on the 2nd of April. On April 3rd the 36′ Topaz released 20 sailfish and the 4th they released 16 sailfish. They also had a couple mahi mahi in the mix. This group went in early on day 2 because their arms hurt from reeling in fish. The 38 Custom released 5 sailfish on a 3/4 day trip. A captain friend of mine on a private boat said they averaged 12 releases a day the last 3 days in March..just 30 miles out…they also added a blue marlin. One of the 42′ Mavericks released more than 40 sails in 3 days of fishing. One captain I talked to said the conditions looked better than he had seen all season. He said the water is good color and temp and there were lots of birds and they were marking sailfish…they went 1 for 3 that day and raised a blue marlin. This captain said on April 1st that the bite looked like it was ready to blow up. 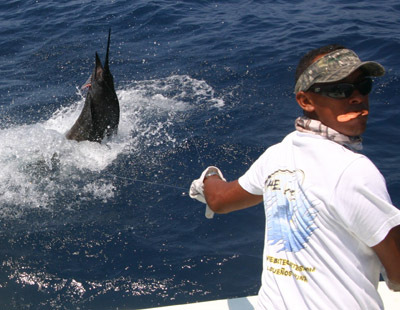 You are currently browsing the Costa Rica Fishing Reports blog archives for April, 2010.